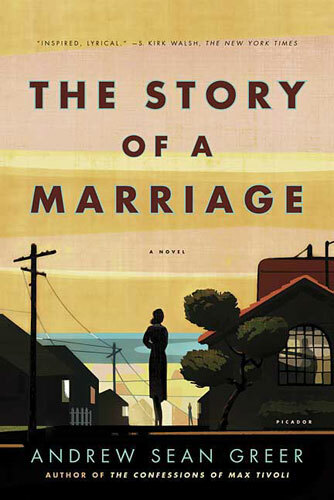 I finished Andrew Sean Greer's The Story of a Marriage this morning, the novel the Fiction Book Group I'm leading is discussing this evening. Ever read this book? It's a beauty, but not much happens. Strike that. A lot happens, but it's centered on emotional turmoil within a marriage, and a third party intent on ending that marriage, all told through the perspective of the wife. Discussing a novel that takes place mostly within the mind of one character seems a little daunting. While there are a few "events" in the plot, much revolves around the musings and experiences of Pearlie, the aforesaid wife. I inherited this group from another librarian who's been unable to lead it for a while, and The Story of a Marriage is only the second book I've chosen for them. Last month's book, The Little Giant of Aberdeen County by Tiffany Baker, was emotionally complex and likewise told in the first person through the eyes of the main character. And how did that book go over? Overall the reaction was positive, even though the book was on the longer side. It also had a very active plot with a lot of twists and turns to engage a variety of readers. What I'll have to do with Greer's book is recap the major events, comparing later revelations with Pearlie's often mistaken perceptions. Then discuss how close relationships aren't always what they appear, that without communication so many things can go terribly wrong. Also, with Greer's book there's a strange quality to the general topic of miscommunication. I can't say much more without giving too much of the gist away, but there's fodder for discussion there, as well, such as how our impressions of a situation don't always match the truth. And, as with most any book these days, it's not always necessary to reinvent the wheel. Greer's website has discussion questions I can use as an example, though I'm not too fond of all of them. But it's a place to start, a stepping-off point for creating my own ideas as to what's relevant and what isn't. I can't get too worked up about it, considering it's only an hour discussion. Surprising how quickly they go. My Nonfiction Group went an hour and a half last time, there was so much to discuss. Plus, okay, we were having fun chatting, too, about advertising and how it sticks in your brain – the more obnoxious the ad the more that's the case. Which was, in our defense, related to the book. Once the discussion's over I'll post about it, including how it all went and what we wound up talking about. Then any other librarian feeling a bit jittery about putting this on a book group reading list may feel a little better about it knowing someone else has tried and suceeded. We're a brood who stick together, you know. Never a lack of information out there for most any book. Sometimes I get stumped, but not usually. Not with so many avenues to research. If you have any ideas on Greer's book I'd love to hear those, too. Just drop me a comment. Next Post I’m a star! I’m a star! I’m a star!